The conference Hydrus Software Applications to Subsurface Flow and Contaminant Transport Problems will focus on applications of advanced numerical models simulating variably-saturated flow, heat transport, and transport of various contaminants (nutrients, pollutants, pathogenic microorganisms) in soils and groundwater. Similarly as the very successful earlier workshops in this series (Utrecht in 2006, Prague in 2008, Tokyo in 2008) the 4th workshop will bring together world-leading and junior scientists and engineers from different branches of the soil, hydrologic, and environmental communities. The conference is not limited to applications involving the use of HYDRUS and its modules. Applications of other numerical tools (e.g., Tough2, SWAP, MACRO) are encouraged and welcomed also. Applications of the HYDRUS modules HP1/2/3, Unsatchem, and Wetlands, as well as other models with similar capabilities. Authors are invited to submit a one-page abstract for oral or poster presentation by Email (to Jiri.Simunek@ucr.edu). Please underline the name of the presenting author, specify the topic, and indicate preference for presentation (oral or poster). Authors will be notified of acceptance of the reviewed abstract before January 31, 2013. Full papers are required before the event (March 21) and will be published in the workshop proceedings. Abstracts: If you still want to submit an abstract (after a deadline), contact us first. Posters: The format should be Portrait A0 (i.e., width × height, 841 × 1189 mm, 33.11 × 46.81 inches). A book of abstracts will be distributed to the participants at the beginning of the workshop. Proceedings with the full papers in electronic form (open access) will be distributed to the participants after the workshop (after the papers are edited and formatted for uniformity by the proceedings editors). Please download the formatting template for proceedings papers (template) and limit the manuscript to 8-10 pages of text. We are open to accept texts other than those presented at the conference, but in such case, please, contact/inform us first. Papers will be screened for content and formatting and we reserve the right to reject them. The fee includes coffee breaks, lunches, welcome reception, and the booklet of abstracts. A confirmation (including an invoice for the registration fee) will be sent to the participants. Since hotels require Credit Card information for booking, the organizers cannot arrange accommodations for the participants. 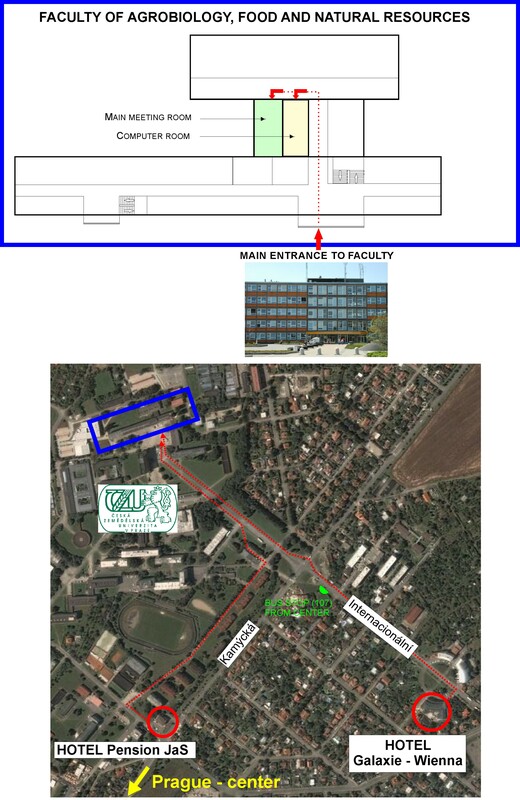 However, we suggest the following hotels close to CULS (Czech University of Life Sciences). Hotel WIENNA – GALAXIE, situated in the villa quarter of Prague–Suchdol is recommended. The hotel has been refurbished completely in a luxurious fashion and provides 150 rooms. There is a Prague local transport bus stop in front of the hotel complex. From there, buses no. 107 and 147 run daily to Dejvická Metro Station on line A of the Prague Metro. For detail information and contacts see: http://www.hotelwienna.cz/index.php?lang=4. Hotel Penzion JaS, situated partly in the villa quarter of Prague–Suchdol is a small but cozy hotel (providing 40 beds). There is a Prague local transport bus stop in front of the hotel. From there, buses no. 107 and 147 run daily to Dejvická Metro Station on line A of the Prague Metro. For detail information and contact see: http://www.penzionjas.cz/. Please kindly note that you are responsible to ensure that all entry requirements for the Czech Republic are fulfilled. Please take all necessary steps to obtain a visa, if necessary. Participants receive a confirmation of the registration by email, which can be used a part of the visa application package. Organizers cannot help you in obtaining a visa!